Demigods and demigoddesses are often mentioned in Vedic literature as the extraordinarily powerful controllers of the material world. The Supreme Being, Krishna, doesn't directly manage the affairs of the universe; He appoints other qualified living entities—His devotees—to act on His behalf. For example, Krishna entrusts Brahma with creating the universe and Shiva with annihilating it. Krishna's expansion, Vishnu, takes charge of its maintenance, but in a "hands off" style; He posts other demigods to look after the various aspects of universal management. The Vedas sometimes encourage worship of demigods as a reward system to encourage pious activity. People desiring temporary, material benedictions worship demigods, with the goal of with goal of enjoying worldly, heavenly pleasures in this life and the next. In the Bhagavad-gita, Krishna discourages such materialistic worship, reminding us that such benedictions, like the demigods themselves, are limited and temporary. He recommends that anyone seeking true, lasting happiness should worship Him instead, since He's the ultimate source of all benedictions and demigods anyway. 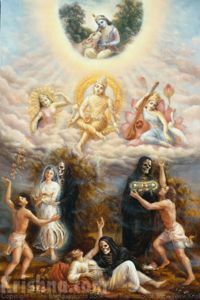 The painting depicts Krishna as the ultimate source of the demigods' power, and how any benedictions given by the demigods are taken away at the time of death. - "when my Hindu family went to temples to offer prayers before the gods, I always wondered why we worshipped so many gods, and who is the real God?" - examining the demigods' role as the "good guys" in the universe. - briefly introducing the demigods and their role in universal administration. - with such a mindboggling range of deities to choose from, how do we know who's worth taking shelter of? "The demigods are empowered administrators of material affairs. The supply of air, light, water and all other benedictions for maintaining the body and soul of every living entity is entrusted to the demigods, who are innumerable assistants in different parts of the body of the Supreme Personality of Godhead." "I am the source of the demigods and sages." "Brahma and Shiva (and what to speak of other demigods) are bhutas, or powerful created demigods who manage universal affairs, much like ministers appointed by a king. The ministers may be ishvaras, or controllers, but the Supreme Lord is maheshvara, or the creator of the controllers." "The demigods are, so to speak, different ofﬁcers and directors in the government of the Supreme Lord. One has to follow the laws made by the government, not by the ofﬁcers or directors. Similarly, everyone is to offer his worship to the Supreme Lord only. That will automatically satisfy the different ofﬁcers and directors of the Lord." "Those who are devotees of other gods and who worship them with faith actually worship only Me, O son of Kunti, but they do so in a wrong way." "Although the impersonal Mayavadi philosophers think that the demigods are illusory, Lord Brahma, Lord Shiva and Lord Vishnu are stated here to be expansions of the Supreme Personality of Godhead and are thus real. Indeed, they are the extraordinarily powerful controllers of the universe. The ultimate truth is a supreme and beautiful person, and thus throughout the creation of God we will always find the personal touch." Isn't Hinduism polytheistic? What’s the difference between Krishna and demigods? What does "demi" mean anyway? Is Lord Shiva a demigod or a different type of entity? What is his role? Are there any demigods who are pure Vaishnavas?